If It's Tuesday, This Must Be Belgium is a 1969 DeLuxe Color romantic comedy film made by Wolper Pictures and released by United Artists. It was directed by Mel Stuart, filmed on location throughout Europe, and features many cameo appearances from various stars. 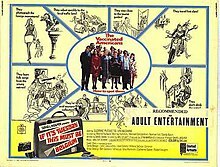 The film starred Suzanne Pleshette, Ian McShane, Mildred Natwick, Murray Hamilton, Sandy Baron, Michael Constantine, Norman Fell, Peggy Cass, Marty Ingels, Pamela Britton, and Reva Rose. The title, also used by a 1965 documentary on CBS television that filmed one such tour, was taken from a New Yorker cartoon by Leonard Dove. Published in the June 22, 1957, issue of the magazine, the cartoon depicts a young woman near a tour bus and a campanile, frustratedly exclaiming "But if it's Tuesday, it has to be Siena," thereby humorously illustrating the whirlwind nature of European tour schedules. This concept formed the premise of the film's plot. Donovan sings "Lord of the Reedy River," which he had also written. He also wrote the film's title song, performed by J.P. Rags. J.P. Rags is a pseudonym for Douglas Cox. Locations where the film was shot include first: London, Great Britain; second: the Netherlands; third: Brussels and Bastogne, Belgium; fourth: Rhineland-Palatinate [with the boat on the Rhein-River from Koblenz to Wiesbaden, Germany; fifth: Switzerland; and last: Venice and Rome, Italy. The film poster shows the cast on the normally pedestrianized Grote Markt square of Antwerp, Belgium, posing for a typical souvenir photo in front of the city hall, with their tour bus obstructing the view of the Brabo fountain which is normally a favorite photo-op with other tourists. Charlie (McShane) is an amorous English tour guide who takes groups of Americans on whirlwind 18-day sightseeing tours of Europe. Among his various clients on his latest trip are Samantha (Pleshette) with whom he wants to have an affair, a man who desires a pair of custom-made Italian shoes from a certain cobbler in Rome, another man (Baron) who is secretly being set up for a surprise marriage with his Italian cousin, and an Army veteran who is reliving his World War II experiences. Donovan singing "Lord of the Reedy River"
If It's Tuesday, This Must Be Belgium earned estimated rentals of $3 million in the United States during its initial run. Vincent Canby of The New York Times wrote in his review: "IF IT'S TUESDAY, This Must Be Belgium may be the first cartoon caption ever made into a feature-length movie. If I remember correctly, that was the legend that appeared some years ago under a New Yorker Magazine cartoon showing two harried American travelers, in the middle of a relentlessly picturesque village, consulting their tour schedule. It was a nice cartoon, made timely by the great wave of tourism that swept Europe in the 1950's. Subsequently, I'm told, there was a television documentary that explored more or less this same phenomenon—the boom in pre-paid (two in a room), packaged culture junkets. Now, some years after the subject seemed really fresh, a movie has been made about one such 18-day, 9-country excursion. Even if you don't accept the fact that just about everything that could be said about American tourism was said earlier by Mark Twain, Henry James or even Woody Allen, If It's Tuesday, This Must Be Belgium is a pretty dim movie experience, like a stopover in an airport where the only reading matter is yesterday's newspapers." Roger Ebert wrote in his review: "Someone -- Mark Twain? -- once said that the American tourist believes English can be understood anywhere in the world if it's spoken loudly and slowly enough. To this basic item of folklore, other characteristics of the typical American tourist have been added from year to year: He wears sunglasses, Bermuda shorts and funny shirts. He has six cameras hanging around his neck. He orders hamburgers in secluded little Parisian restaurants. He talks loudly, and the female of his species is shrill and critical. He is, in short, a plague. This sort of American tourist does still exist, but in much smaller numbers. My observation during several visits to Europe is that the American tourist has become poorer and younger than he used to be, and awfully self-conscious about being an American. On the average, he's likely to be quieter and more tactful than the average German or French tourist (who doesn't have to prove anything). The interesting thing about If It's Tuesday, This Must Be Belgium is that it depicts this new American tourist. That's amazing because movies of this sort usually tend to be 10 years behind the times, and I went expecting another dose of the Bermuda shorts syndrome. "If It's Tuesday" isn't a great movie by any means, but it manages to be awfully pleasant. I enjoyed it more or less on the level I was intended to, as a low-key comedy presenting a busload of interesting actors who travel through England, Belgium, Germany, and Italy on one of those whirlwind tours. There is a lot of scenery, but not too much, and some good use of locations in Venice and Rome. There are also some scenes that are better than they should be because they're well-acted. Murray Hamilton is in a lot of these scenes, and they're reminders that he has been in a disproportionate number of the best recent comedies: The President's Analyst, Two for the Road, and The Graduate (he was Mr. Robinson)." (Ebert’s opinion of Hamilton’s acting was well-founded — and Hamilton did play Mr. Robinson in The Graduate — but the actor was not in either Two for the Road or The President’s Analyst. Rather, it was William Daniels who appeared in all three of the named comedies in the 1960s (he played Benjamin’s father in The Graduate). If It's Tuesday, This Must Be Belgium was remade in 1987 as a made-for-TV movie titled If It's Tuesday, It Still Must Be Belgium directed by Bob Sweeney. The film starred Claude Akins, Lou Liberatore, Courteney Cox, Bruce Weitz, Stephen Furst, Anna Maria Horsford, Kene Holliday. Kiel Martin, David Leisure, Doris Roberts, Tracy Nelson, Richard Moll, David Oliver, Lou Jacobi, and Peter Graves. If It's Tuesday, This Must Be Belgium was released in theatres on April 24, 1969. The film was released on DVD on May 20, 2008. Olive Films released a Blu-Ray edition in 2016. ^ If It's Tuesday, This Must Be Belgium, Box Office Information. The Numbers. Retrieved May 26, 2012. ^ a b "If It's Tuesday, This Must Be Belgium". Turner Classic Movies. Atlanta: Turner Broadcasting System (Time Warner). Retrieved November 19, 2016. ^ Canby, Vincent (April 25, 1969). "' If It's Tuesday, This Must Be Belgium' Opens". The New York Times. New York City: The New York Times Company. Retrieved November 19, 2016. ^ Ebert, Roger (May 30, 1969). "If It's Tuesday, This Must Be Belgium". RogerEbert.com. Chicago: Ebert Digit LLC. Retrieved November 19, 2016. ^ "If It's Tuesday, It Still Must Be Belgium". Turner Classic Movies. Atlanta: Turner Broadcasting System (Time Warner). Retrieved November 19, 2016. ^ "If It's Tuesday, This Must Be Belgium". United Artists. Beverly Hills, California: MGM Holdings. May 20, 2008. ASIN B0014BJ1AO. Retrieved November 19, 2016.